This tutorial explains how to download, install, and configure Webmin on Ubuntu 18.04 server. 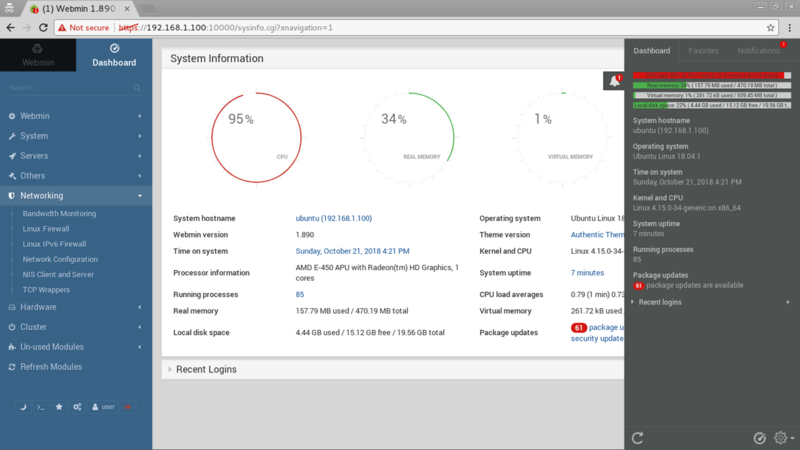 Webmin is very lightweight graphical user interface to administrate your Ubuntu server. Using the web-based interface you can perform many administrative tasks including: installing softwares, user management, system monitoring, networking, backup configuration, firewall configuration and many more. Following are the steps to download and install Webmin on Ubuntu 18.04 server. You can connect to Webmin using your server's IP address or domain name (Webmin runs on port 10000. So we need to specify the port number as part of the URL as well). Open your web browser and type https://server-ip:10000 (For example, https://192.168.1.100:10000). When you access Webmin for the first time, web browsers will display a warning message like: Your connection is not secure or Your connection is not private. You can ignore this warning, Click on Advanced to add an exception and proceed to Webmin. You will get the Webmin login page. Log in using the root user account or any other user who has sudo privileges.